Ages 5 through 11. Strengthen vocabulary, grammar, verbal reasoning, storytelling, and pragmatic language skills using the high-interest stories and activities in this book. After listening to each story, students are asked to respond to questions and to perform activities related to the story events. Skills emphasized include recalling story details, describing events and situations, sequencing story events, creating story endings, telling original stories, understanding cause-effect relationships, giving explanations, defining words, and using synonyms and antonyms. The activities are appropriate for students with language disorders, attention deficits, reading disabilities, and English language learners. As students participate in the activities, they meet Alvis the Elephant, the jungle's king of rock and roll. Alvis lives in a large castle called Alvis Land. He has a deep, deep voice and is known throughout the world for his music. Everyday Situation Stories. Stories relating to familiar experiences such as caring for animals, playing with friends, cooking meals, caring for a garden, and visiting places in the community, are presented. Each story includes four black-line illustrations that show the critical events of the story. Jungle Island Adventure Stories. The stories in this section spark the imaginative uses of language as students listen to tales about the adventures of Alvis the Elephant, a famous rock star, who spends his days playing music and helping others when they encounter problems. Each story is accompanied by six reproducible pictures. The book also includes incomplete stories that students are asked to finish. This activity is designed to stimulate creative thinking and the imaginative uses of language. 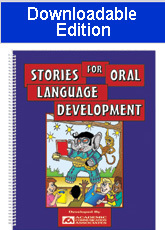 Stories for Oral Language Development (SOLD) is an essential resource in programs for children with communication disorders, listening comprehension deficits, and auditory processing difficulties. No school should be without ALVIS THE ELEPHANT, the International King of Rock and Roll! Note: This product is also available in a printed book format. Select the RELATED PRODUCTS link below to view.